In crystallography, the terms crystal system, crystal family, and lattice system each refer to one of several classes of space groups, lattices, point groups, or crystals. Informally, two crystals are in the same crystal system if they have similar symmetries, though there are many exceptions to this. Crystal systems, crystal families, and lattice systems are similar but slightly different, and there is widespread confusion between them: in particular the trigonal crystal system is often confused with the rhombohedral lattice system, and the term "crystal system" is sometimes used to mean "lattice system" or "crystal family". A lattice system is a class of lattices with the same set of lattice point groups, which are subgroups of the arithmetic crystal classes. Each lattice is assigned to one of the following centering types based on the positions of the lattice points within the cell: primitive (P), body-centered (I), face-centered (F), base-centered (A, B, or C), and rhombohedrally-centered (R). 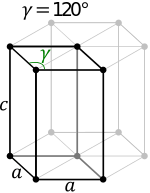 The 14 unique combinations of lattice systems and centering types are collectively known as the Bravais lattices. In total there are seven lattice systems: triclinic, monoclinic, orthorhombic, tetragonal, rhombohedral, hexagonal, and cubic. A crystal system is a set of point groups in which the point groups themselves and their corresponding space groups are assigned to a lattice system. Of the 32 point groups that exist in three dimensions, most are assigned to only one lattice system, in which case the crystal system and lattice system both have the same name. However, five point groups are assigned to two lattice systems, rhombohedral and hexagonal, because both lattice systems exhibit threefold rotational symmetry. These point groups are assigned to the trigonal crystal system. In total there are seven crystal systems: triclinic, monoclinic, orthorhombic, tetragonal, trigonal, hexagonal, and cubic. A crystal family is determined by lattices and point groups. 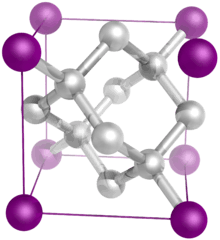 It is formed by combining crystal systems which have space groups assigned to a common lattice system. In three dimensions, the crystal families are identical to the crystal systems except the hexagonal and trigonal crystal systems, which are combined into one hexagonal crystal family. In total there are six crystal families: triclinic, monoclinic, orthorhombic, tetragonal, hexagonal, and cubic. Spaces with less than three dimensions have the same number of crystal systems, crystal families, and lattice systems. In zero- and one-dimensional space, there is one crystal system. In two-dimensional space, there are four crystal systems: oblique, rectangular, square, and hexagonal. Point symmetry can be thought of in the following fashion: consider the coordinates which make up the structure, and project them all through a single point, so that (x,y,z) becomes (−x,−y,−z). This is the 'inverted structure'. If the original structure and inverted structure are identical, then the structure is centrosymmetric. Otherwise it is non-centrosymmetric. Still, even for non-centrosymmetric case, inverted structure in some cases can be rotated to align with the original structure. This is the case of non-centrosymmetric achiral structure. If the inverted structure cannot be rotated to align with the original structure, then the structure is chiral (enantiomorphic) and its symmetry group is enantiomorphic. A direction (meaning a line without an arrow) is called polar if its two directional senses are geometrically or physically different. A polar symmetry direction of a crystal is called a polar axis. Groups containing a polar axis are called polar. A polar crystal possess a "unique" axis (found in no other directions) such that some geometrical or physical property is different at the two ends of this axis. It may develop a dielectric polarization, e.g. in pyroelectric crystals. A polar axis can occur only in non-centrosymmetric structures. There should also not be a mirror plane or twofold axis perpendicular to the polar axis, because they will make both directions of the axis equivalent. The crystal structures of chiral biological molecules (such as protein structures) can only occur in the 11 enantiomorphic point groups (biological molecules are usually chiral). These lattices are classified by space group of the translation lattice itself; there are 14 Bravais lattices in three dimensions; each can apply in one lattice system only. They represent the maximum symmetry a structure with the translational symmetry concerned can have. The relation between four-dimensional crystal families, crystal systems, and lattice systems is shown in the following table. Enantiomorphic systems are marked with asterisk. The number of enantiomorphic pairs are given in parentheses. Here the term "enantiomorphic" has different meaning than in table for three-dimensional crystal classes. The latter means, that enantiomorphic point groups describe chiral (enantiomorphic) structures. In the current table, "enantiomorphic" means, that group itself (considered as geometric object) is enantiomorphic, like enantiomorphic pairs of three-dimensional space groups P31 and P32, P4122 and P4322. Starting from four-dimensional space, point groups also can be enantiomorphic in this sense. ↑ Flack, Howard D. (2003). "Chiral and Achiral Crystal Structures". Helvetica Chimica Acta. 86 (4): 905–921. doi:10.1002/hlca.200390109. 1 2 Whittaker, E. J. W. (1985). An Atlas of Hyperstereograms of the Four-Dimensional Crystal Classes. Oxford & New York: Clarendon Press. 1 2 Brown, H.; Bülow, R.; Neubüser, J.; Wondratschek, H.; Zassenhaus, H. (1978). Crystallographic Groups of Four-Dimensional Space. New York: Wiley.